Is she crazy? How the heck am I supposed to find the time to sit down and write out 3 pages each morning? That was my gut reaction when I first heard about Julia Cameron’s Morning Pages. And if you aren’t someone who is already doing morning pages, your reaction is probably going to be along the same lines…. But I’m happy to say that I was dead wrong. Morning Pages are one of these things that sound so simple that you don’t think they could ever work for you. One of the things that I have realized in life is that many of the best things are really simple but our complicated minds want to tell us they won’t work for us. There is no wrong way to do Morning Pages– they are not high art. They aren’t even “writing.” They are about anything and everything that crosses your mind– and they are for your eyes only. Morning Pages provoke, clarify, comfort, cajole, prioritize and synchronize the day at hand. Do not over-think Morning Pages: just put three pages of anything on the page…and then do three more pages tomorrow. What are the Benefits of Morning Pages? In the 241 days since I started doing Morning Pages, I have missed doing them twice. On both of those days, I was a bit more anxious, my thoughts were muddled and I just felt off. Could it be the Placebo effect? Possibly but I don’t think so. They center you and clear your mind. We wake up with a ton of stuff floating around in our minds. We need to channel that energy and get it out. Morning Pages act as a ‘brain dump’ that will clear your mind to focus on other things. Whether it’s the small distracting thoughts that can take our attention or bigger, more challenging issues that can at times hijack our thoughts, Morning Pages allow us to “dump” all the “stuff”, making way for more constructive and creative thinking. They help you discover your creativity. In order to retrieve your creativity, you need to find it. And it’s through this seemingly pointless process that you are able to find it. You discover things that have been hidden inside you and stuffed down in the business of life. They help to silence your biggest enemy. They make you less anxious. Writing helps sweep away anxiety. Envy, anger, fear, vulnerability, procrastination…all those emotions can be put on paper and seen for what they are. By getting this stuff out and looking at it, you realize it’s not so bad and it helps to ground you. 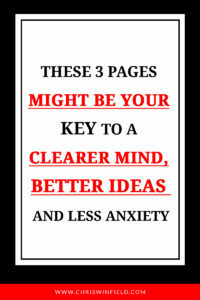 They will help you become a better idea generator. I’ve talked a lot about the power of generating ideas on a daily basis. Your Morning Pages practice will help you take this to a new level. If you’re reading this blog post, there is a good chance that you do a lot of your work on a computer and/or mobile device. There’s a good chance that you haven’t written anything in depth or meaningful on paper in a long time. So it would make sense to you to simply type your Morning Pages out each day. You figure that you can get it done faster (since you type so much faster then you write). Velocity is the enemy. It takes longer to write by hand, and this slowness helps connect us to our emotional life. This was hard for me to understand at first. Writing by computer is more emotionally detached practice. It helps keep our Inner Critic alive and well since we are so easily able to go back and fix our mistakes. It yields us speed and distance, but not the depth that we are looking for. Velocity is more often our enemy than our friend. Think of writing morning pages on the computer as if you are driving 80 miles an hour. “Oh– wait, was that my exit?” we exclaim, glancing back over our shoulder at the destination we have blown past. When we write by hand, it is more like we are driving 60 miles an hour. “Here comes my exit,” we say, well before we get to it. “Look, there’s even a gas station there. And what beautiful foliage…” In other words, we notice ourselves and our surroundings. And in doing this, the paradox is that we are ultimately more effective– and, yes, efficient– throughout our day. The idea behind the morning page is so simple. Wake up and write three letter-size, handwritten pages each morning. You write in the morning because that’s when the veil of the ego is said to be the thinnest. It’s almost as if your ego needs extra time to wake-up and start with all of its demands for the day. Take advantage of this. The amazing thing is that stuff will start coming to you. I can’t explain it but it does. To help you practice writing Morning Pages, I made a FREE worksheet you can use. Click the image below to download it right now! How Can I Make Time for Them? I’ll be honest with you, I don’t think that I would do any of the practices in my Daily Routine if I didn’t think they were making me a better person and ultimately improving my life. Morning Pages are a great example of this. Yes, they take time to do (about 30-40 minutes), but they actually make more time than they take because we move more efficiently through our day. Just like everything else I do, I had to experiment to find the right way to use this tool. Something that would work for me. I encourage you to do the same. For something that has no wrong way to do it, there sure does seem to be a lot of rules or suggestions for the ways to do the Morning Pages. I break a lot of them… Here’s exactly what I do each day. I start my Morning Pages after I wake up (obviously), meditate and make myself a cup of coffee. The first two pages are focused on clearing my mind. I write about whatever pops in there. It can be mundane stuff or very serious issues, something inspiring or something that might be depressing. It’s based on completely where I am at that moment in my life. I try hard not to judge myself and just do it. I try to keep my writing positive but that’s not always possible. And that’s also okay. Some of the writing is in the first person. Sometimes it switches to the third person. Some of it is me talking to my Higher Power/the Universe/Creative Intelligence and some is me ‘listening’. If I come up with an idea that I want to revisit later (so that I can flesh it out), I either make a mark on the page or I stop and jot it down in a different notebook or put it into Evernote. You’re not really supposed to re-read your Morning Pages but if I didn’t come back, I would miss out on a lot of great ideas. I will meet with John Smith and it will be amazing! I will really be able to help him and there will be a great reason for us to work together. I will finish writing my Morning Pages blog post and I will love doing it. This post will really help people. This last page of intentions is absolutely crucial to me because it helps me to focus my day even more and gives me a rough outline of the most important parts for later. Before you even start, remember this: There is no wrong way to do morning pages. When we start some new course of self-improvement, whether an exercise program, a spiritual practice or morning pages, we tend to expect immediate results. At least I do. And If I don’t see results pretty quickly, I tend to find reasons to stop doing the exercise. I decided this morning that I’d commit to doing morning pages for 30 days without any expectation of results. Are you ready to get started? Please share your thoughts about the Morning Pages in the comments below. Have you started to do Morning Pages and want to know how to make the rest of your day even better? Well, you’re in luck! 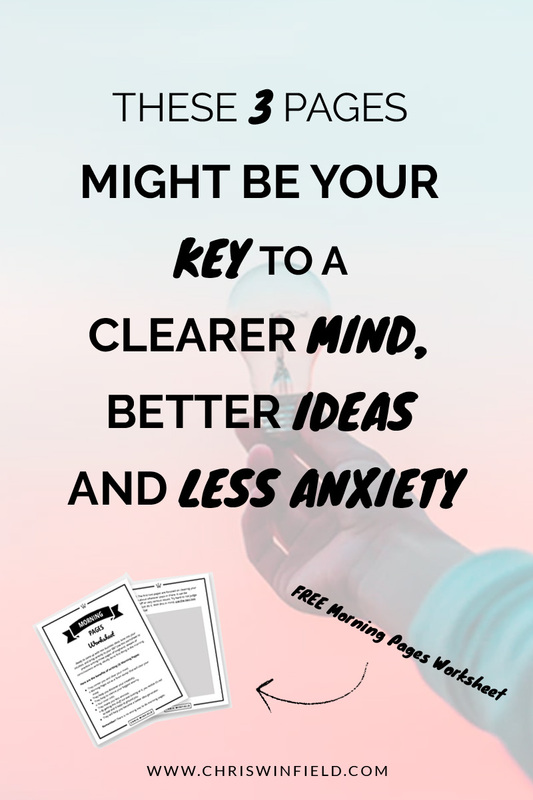 I created this worksheet that will show you exactly how to discover your creativity, center and clear your mind, and become a better idea generator. Quite interesting … & makes lots of sense. Thanks for commenting Dan — let me know how it goes if you try it! Great post, and what I like best is that you said you wouldn’t do it if it didn’t help you/make you a better person. This says a lot–that you do something for 30 minutes each morning–because it works! And by making your third page about your daily plans/positive visualizations-outcomes, you really incorporate some other kinds of spiritual ideas in the morning pages practice. It’s so cool. Thanks! Give it a try and let us know how it goes Jeremy! Thanks very much for posting this article! I tried doing the morning pages for the first time this morning and it was a very enlightening experience. I have a question for you though. Do you always have to write three pages? What if I want to write two pages one day and maybe five the next day? Is that okay? Thanks for the comment Sandra — great job with getting this started! Julia Cameron is pretty insistent on 3 pages but do what works for you right now. Just start and get in the habit of doing them each day (even if you have to build up). Does 3 pages mean front and back, both sides, or 3 8-1/2 x 11, singe sided? I enjoyed this especially because I have felt the same way. I have been writing morning pages for several months and thought they were crazy at first but I have actually found them valuable. I committed to trying the artist’s way for 12 weeks. It was great and I am actually continuing the pages. My question though is what do you do with the pages after you write them? Some say toss. Some say save. Thanks for your feedback Claudia! Attempted the morning pages years ago but the inner critic prevailed. Also, bought most of Julia Cameron’s books which I treasure. Now your blog (AKA pep talk) just inspired me. I can do this! Thanks, coach. That’s awesome Leslie — thanks so much for sharing! Thanks so much for sharing this Cheryl — it really made me smile! I hate, hate, hate morning pages. But they work! Hi Chris…. I enjoyed your “nudge” to get back into the morning pages. I had done them for many years, and came to discovery thru doing this discipline my long-repressed artist/writer. What I never did really seem to overcome, however, was this tremendous and intense sadness… nearly every day I sat to write. I allowed it to surface, and went with it. But man, it was tenacious, had a lot of velocity, and was always present. I found, after many years of adoring the many dimensions that seemed to be “channeling” thru me, that this victimhood tendency became boring, and wore me out. I couldn’t see the benefit of feeling rather disempowered and, well, sad…. on a daily basis, so I eventually stopped. I must say, in retrospect, that in spite of that dynamic (which I don’t desire to oppress, so I embrace her too)… the multitude of benefits that came with doing the morning pages far outweighed my sadness. I have also walked with serious depression for most of my life, so I feel like that victim voice is from the very tone of depression (oppressed expression). I would love to know if others experience anything like this, as I sometimes still have ambivalence toward it, as it’s not a “cut and dry method” for me to plan my day. At all. The guts. The glory. The bleeding. The oozing. The planning. The creation. It’s messy, and it’s beautiful. At least for me. It also aligns me with my deepest spiritual compass and inspiration. So for that alone… I will return to my beautiful mess. Thank you for the inspiration. Wow, thank you so much for this comment Lori, I really appreciate you sharing! I sometimes will have sadness in my morning pages but it’s not overwhelming. I just let it work itself out most times. I think that by the simple act of starting my morning pages with this sentence: “Today is going to be the best day ever!” that it helps to put my mind in a positive place to start. Little things like that really help me. Please check back and let us know how it goes with your renewed practice. I started a journal when I was 13, and the only time I really had that was all mine was the hour before I went to bed, so every night I would write down my day, the good, the bad, and the ugly. Then I would write my hopes, fears, and dreams for the next day, week, month, and my summer plans. I did these faithfully all through 7-12 grades, all through college until my dad died at 26, but that’s an entirely different story.For me, writing out my day before going to sleep, put the day behind me. It allowed me to let go of all the “stuff” of the day and I woke up starting new. Also, once I wrote it down, I was done with it. I’ve done morning pages, but I’m truly not a morning person. I think regular journaling is beneficial no matter when you write. I think regular journaling is beneficial no matter when you write. I definitely agree with you Allison! I also do a quick inventory of my day at night and it’s super helpful. I personally believe that we are all wired a bit differently and something that might work really well for someone (writing in the morning) might not work as well for someone else (someone who isn’t a morning person) but just taking some positive action (journaling) is so good! Am not a morning person either (except under duress) but love the evening hours to reflect so I switched my three pages to the evening. It was a way to “let go”, express gratitude for what was and dream for the next day. Your specific suggestions for the third page tied in beautifully! I sleep better and synchronicities are on the rise. Thank you and Julia in abundance. That is so awesome Mary! I think making the morning pages “work” for you is the key. This came to me at the best time. I was making a list of things I want to start to do so this is on the list and I am going to do 3 pages…again. thanks for the inspiration. That’s so great to hear Cassidy! I read Julia’s book years ago and wrote morning pages for about a month. It really helped but somehow, I allowed life to get in the way and I got out of the habit. I will definitely get back into this practice. Thanks for this reminder of a great process! I loved what you had to say about Morning Pages and agree with you heartily. I was surprised, however, that you made no mention of Julia Cameron who started countless thousands of us on the Artist’s Way. If I am not mistaken, she is the one to first encourage Morning Pages, and I would surely want her to be credited with that powerful, simple tool. And she would be delighted when anyone shares that idea and its potential benefit with others. I owe Chris an apology. I read right past his acknowledgement of Julia Cameron as the source of his introduction to Morning Pages. Obviously, she did receive credit as she was due, and I need to pay better attention! Keep spreading the good word, Chris. You did a wonderful job of stating the value of this simple exercise, and I thank you for that! I was introduced to this from a dear friend whom I so look up to! Today was the first day of the rest of my life and I want to make it better! I began my Morning Pages this morning and am excited to do this! Not a morning person but strive to make this a new goal to do! I have journaled off and on over the years but not in this format. Thanks to Julia, Mary and you for bringing this to my attention! I loved reading this Sherry — thanks so much! Good Morning, Chris. Great blog for me this morning. I have done morning pages in the past, and strayed away from them. However, they have been on my mind, and I sensed I needed to get back to them. So, you blog this morning, was just what I needed to get jump started. For today, I will focus on doing my morning pages tomorrow. And I’m feeling a bit excited about the prospect!!! Thanks, Chris. Have a most awesome day. This is so awesome Debbi! I love your take on MPs (what I call them). I’ve been doing them for the better part of 10 years and I feel lost when I don’t do them. I appreciate the way you’ve taken the 3rd page for visualization – I think I might try that tomorrow. Thanks! Hi Chris- I am 2 weeks and counting with my Morning Pages. It has inspired me to make some radical changes to my artist website! Thanks. That’s so great to hear Elizabeth — thank you for letting me know! Great article on morning pages ! A friendly reminder why it is so important to stay consistent. I was good for 3 years while living in BC and I’ve never had so many “dreams come true”. I won a writing contest, published an article and got paid by a major magazine, wrote various music reviews (health and fitness is my field, but I have an underlying passion to also write about music so being accepted to write for websites was a wow experience) …. I essentially found my creative self and it was amazing. I am starting again now for 2015. Your article just reminded me how important it is and to not judge myself…. Thanks! Awesome May — please let me know how it goes! Hi mr.winfield i really owe you a great thanks because i used you topic and article for my presentation in university of course i mentioned my source and introduce you to my friends. anyway thanks for your great articles i wish as i enjoy them i can do them in my real life. I had heard of this technique being used for songwriters, but I hadn’t thought about using this to start my day. I often struggle with getting up and staying up so this is a great help! Too often do people forget that it’s all about putting your thoughts on paper, without any preparation or thinking too much about it. I love the way you do the morning pages exercise. The first sentence you write is a positive affirmation and lets your mind embrace the new day with joy and peace. I think it’s a great solution for those who have a hard time starting their morning pages. They can just write down a positive statement about life in general, or something they are grateful for, or just a reminder that this new day is a gift. And they can use it as a starting point each morning to build momentum and let words flow. I have been doing Morning Pages for more than 15 yrs., and it has changed everything. I also draw a mandala at the end of writing my pages. Now, I schedule nothing in the morning, because this is sacred time. It is as necessary as breathing to my day. What a beautiful idea! I’m sure your mandalas bring you lots of great energy!! =] Thanks for sharing! I came across this topic in a post I used with my students in class today and I decided to dig a bit. I’m definitely giving it a try!! Thank you for the idea and links throughout the text – they are amazing!! Thanks Chris, I came across this site when writing my own far more basic post on Morning Pages. Think I linked back to you. Anyway am now past the 1 week mark of doing them daily by hand. Had tried typing them on and off before. The only thing I do differently from yours is that I write Today is going to be the best day ever as the last line, rather than the first. And I always read the last line of the day before I start writing. It’s a pretty awesome way to start the day! This may sound like a silly question but when you say three pages does one page mean an A4 sheet of paper both sides?? Thanks for the blog. I have 500 plus streak going on 750 Words. Because I do not know anyone else that is doing it, I was thinking I may be a little nuts. The most helpful part was you saying that you write in the first person, but not always. This happens to me and I do not know where the thoughts or ideas come from, but they come and I write them. Thus the thinking that I may be a little nuts. Again thanks for sharing what you do in your writing. I loved it. Hi Chris, i found your writing so inspiring. well this is something that so many people have already told you. but i have started practicing it. it is helping me. its only a week by now that i have started this. i am a student and looking for a good job. so for me my studies are all too important and also to be settled in a career. sadly i could not find any mentor for me. which i feel is the reason for lack of control in my life. but by god’s grace hopefully i would find a mentor who can help me in this process… thank you once again… well i found that power breathe too scary…. :-). i am little sensitive to my breathe. but really thank you. i am so excited about this, but my question is how long is a page? i mean how many lines is a page? are we getting a notepad or a notebook, or a long note book? Great article and very informative. I just want to get your take on how to handle a practice like this is you work the night shift for 4 or so nights a week and therefore spend a lot of time sleeping in the daytime? Okay so what does one do with the notebooks when they are full?? I’ve been practicing morning pages for about two weeks now, and it’s going great, I just have one question…is there any age criteria for doing this? So today was my first day writing morning pages, and let me tell you, I feel amazing and lighter if that makes sense… I was typing it because I have a 17 month old baby who needs a lot of attention but found that I got distracted so easily. By writing I felt true to my word! It’s so nice. Anyway, I was wondering if ONE page is front and back? I did one page, not front and back, and it seems a little short. Just something that’s been stuck on my mind and am dying to know the answer lol. Thanks for the article, great read! So today was my first day actually writing, I have been typing my morning pages and it makes such a big difference! I love this article, you bring up a lot of different points and benefits to morning pages which made me realize that I actually need it in my life. So after writing my three pages it seemed very short. Do you consider one page Font & Back? It’s killing me lol! Thanks again! Thanks for giving us all those advices and for explaining us how to try dealing better with ourselves. I’ve been working on doing these three pages every morning and I think that I’m now close to get it right. I mean to do this regularly and hopefully. This is amazing! I’ve been trying to find the best morning routine for me and this is something I’ve really been trying to incorporate so thank you for the advice. I have one question, do you meditate before or after you do the morning pages? Or do you feel it doesn’t really make a difference which you do first? And lastly, what type of meditation do you practice? Thank you! Great read. I’ve been doing morning pages for just over 15 months now. They’ve become my keystone habit and a fundamental part of the morning routine. Morning pages are extremely impactful and I think most people could benefit greatly by following your recommendations. Ah, now I know why my journal entries tend to be mundane and whiny. Lol. Thanks. Great post. I’ve only done this for several days, and can feel all the benefits you describe. I think it’s a great way to break stagnancy in any area. One suggestion I’d make though…I believe it’s more beneficial to write without any thoughts or structure involved. I’ve tried it both ways. I’m a huge fan of this process. I always say TRUST THE PROCESS. In the beginning this can seem tough but after some time with this your body yearns for it. Give your mind the opportunity to remove the clouds and see the Sun! I tried to do the morning pages but I couldn’t complete even a page..My mind was totally blank and I did not know what to write..I tried it for a few days and it was still the same..
How do I get past this block?? I have a question. Ok. I read Julia’s ‘The Artist’s Way” …somewhere around 2000 & immediately started the Morning Pages practice. There were periods where I did write them on a computer for a bit but everything else about the routine was kept in line. Oh- and I at some point added a 4th page which I called my Gratitudes Page. Then fast forward to last year… I had a rather life-altering run-in with encephalitis that brought a few rather unsavory people into my life to reap the rewards of my horrible short-term memory combined with my tendency toward honesty. One of them took as many of my old notebooks as possible & obsconded them off somewhere. I don’t know if she even bothered reading em or just trashed em or maybe even sat around the local pond, reading em out loud to a bunch of homeless crackheads… I just know they’re ALL gone & that seriously interfered with my previously established (&faithful) practice cuz every time I pick up a comp book to start writing I’m immediately reminded of ALL those missing years of writing. Hence my current poking around, looking for slightly different approaches so it’s not so triggering. Thanks for putting the word out there about MP’s cuz yuppers- they are awesome. Very very helpful & that 4th Page of Gratitude seriously gives a nice boost to all things positive in our lives. Oh ya- my question! Any advice or suggestions on breaking my association of the MP’s with the anger, betrayal, & straight up pain that all those missing notebooks have brought up? All the years I was writing them, I’d had it in the back of my mind that once my daughter came of age I’d give them all to her so that she could see/learn about the mother she barely got to know before being adopted by a family member when she was 4. So- that’s the pain that comes up every morning as soon as it’s time to sit down w/ my coffee & write. I’m hoping to find a way past/through this cuz damn do I miss my MP’s wake-up routine & all the positive fallout from such a practice. Given this idea, perhaps if you start writing again, you can try this ritual of destroying the pages and this might help reframe the loss of your original pages as having this beneficial result, too? What do you think about that idea? Great article…as far as I could read without getting exhausted due to all the FB, Twitter, Pinterest, etc buttons right over the text. It’s a pitty….There is a very little room on the bottom of the page where I could read the very first words from the left. I promise I’m back to finish reading the article if it’s made easier to read. I tried to download the report and the link is not working for me. Any suggestions? Chris, I am very stingy with my email address- a popup is one way to guarantee I won’t give it to a site. But I noticed no popup on this page, and I loved the article- you drill down to specifics, offer examples and action items so compelling I saved them elsewhere. I downloaded your ebook and you have my personal info now for your list. Thanks for being truly worthy of it. Thank you for sharing so much appreciated. I did a search and your post popped up. I’ve tried Morning Pages in the past and loved the exercise however after three months I didn’t follow through as I keep a regular journal and it became too much or I just didn’t make enough time. I love journaling and I’d like to resume my morning pages not at the expense of doing away with my journal as I like to read over my journals from time to time and Morning pages aren’t supposed to be Re-read. I’m torn but I do want to give it another go. So glad you decided to start doing it Esther! My friend told me about Morning Pages. I’ve really been thinking about it. I read everything you had and all the “helps” you mention. Decided it’s time to stop thinking about it and get busy writing and believing it will be the beginning of all for which I’m desperately wanting. It sounds great. I guess now it is up to me. I’m starting tomorrow!